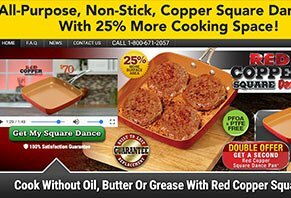 Red Copper Square Dance Pan Reviews - Is it a Scam or Legit? Red Copper Square Dance Pan features a ceramic non-stick cooking surface, up to 25% more surface area than the competition, high, anti-splash sides, and more. With high sides that prevent grease from splashing out, Red Copper Square Dance Pan is an all-purpose pan infused with 100% real copper that promises to deliver 25% more cooking space. On top of this, we’re told Square Dance Pan’s ceramic cooking surface won’t scratch, chip, or peel; allows you to cook without oil, butter, or grease, and is PFOA and PTFE free. Underneath Square Dance Pan’s ceramic surface, the company tells us you’ll find an induction-ready plate that allows you to cook on any stovetop. It’s even oven-safe up to 500 degrees! At 9.5" across and 2" deep, it’s easy to see that Red Copper Square Dance Pan might help you cook a lot of food at once. But is it worth the money? Can you expect it to deliver real-world performance for the long haul? We’ll explore these important questions in this review. How Does Non-Stick Cookware Work? What About Induction Cooking? In 1938, a substance known as PTFE fluoropolymer resin was discovered by a DuPont chemist named Roy J. Plunkett. It wasn’t until the early 1960s, though, that Teflon was applied to cookware, since it provides excellent non-stick properties in a dry, easy to apply, and relatively durable coating. The problem is that, while Teflon is durable, it’s not impervious to damage. And over months and years of regular use, tiny particles of the non-stick coating can flake off into food. When ingested, two of the main chemical components in Teflon (PTFE and PFOA) can lead to some adverse health problems; everything from flu-like symptoms to an increased risk of cancer. More recently, however, many manufacturers have replaced Teflon in their cookware with ceramic coatings, which often promise to provide much of the same non-stick ability, but without the health concerns. We’ll talk more about the ceramic found on Red Copper Square Dance Pan in a moment, but before we do, let’s talk about one more thing: induction. Instead of using an open flame or a hot coil, induction cooktops use magnets to generate heat directly inside cookware, which then transfers to food. Most users also report more even heat distribution and faster heating times. The bad news is that you need induction-specific cookware (like Square Dance Pan) to use an induction cooktop or a naturally magnetic material like cast iron. Sounds good, right? But how much will you pay for Red Copper Square Dance Pan’s ceramic and induction features? How Much Does Red Copper Square Dance Pan Cost? Whichever offer you choose, all orders come with a 30-day refund policy, less S&H, along with a lifetime replacement guarantee. To request one, you’ll need to reach out to BulbHead (a division of Telebrands) customer service at 855-668-1655. Are There Any Reviews for Red Copper Square Dance Pan? In short, no. This is because the HighYa team tends to review many ASOTV products as soon as they hit the shelves, so there often isn’t enough time for them to have garnered any online feedback. However, we have reviewed several other products in this lineup, including the original Red Copper Pan, Red Copper Square Pan, and more. We even performed hours of in-depth testing on the original. While we found it worked exactly as advertised soon after arriving, after several uses and washes (including a cycle through the dishwasher), we learned that Red Copper Pan lost almost all of its non-stick ability and didn’t perform very well without some oil, butter, or grease. Based on nearly 100 reader reviews for Red Copper Pan, it seems that many customers experienced much of the same, giving it an average rating of 2.3 stars. Now, perhaps the manufacturer addressed this issue with the Square Dance Pan, but we’ll have to wait until feedback starts rolling in to be sure. Speaking of which, Red Copper Square Dance Pan is brought to you by Telebrands, the largest company in the ASOTV industry, who seems to have a mixed reputation with many of their other products, including recent hits like Lazer Bond, Grass Shot, Smart Swab, and more. In 2015, the company was also investigated by the NJ Attorney General’s office for allegedly violating the Consumer Fraud Act, which was eventually settled for $550K after admitting no wrongdoing. Will Red Copper Square Dance Pan Have You Dancing With Excitement? If you enjoy food, whipping up a delicious meal in the comfort of your home can be invigorating. And it’s even better if you can do this while cooking with less oil, butter, or grease, or without worrying about potential health consequences. However, as we discussed above, while some customers report success with the original Red Copper Pan, many also complained—and something we confirmed in our testing—that the ceramic surface quickly loses its non-stick ability, requiring you to use oil, butter, or grease. Despite this, perhaps Square Dance Pan’s biggest benefit it that it’s shaped like a griddle with high sides, which isn’t necessarily something that’s easy to come across with the competition—not to mention the fact that its core price is much lower than a lot of other non-stick griddles on the market. In the end, you’ll have to decide if this feature makes Red Copper Square Dance Pan’s price worthwhile, or if you should keep looking. Just remember that you could lose up to $18 is non-refundable fees if you choose the BOGO offer, plus whatever it’ll cost to ship back to the company if you’re dissatisfied. Did you decide to order Red Copper Square Dance Pan? If so, be sure to add your voice to the conversation by writing a review below! My first issue was no lid. I didn't realize that or I would never have bought it. But I've treated it like they said, but it doesn't last. I treated it again, and it just wears off. So I'm very disappointed. It's such a disappointment! Unlike most reviews I've read, I don't expect a "non-stick" pan to not stick, ever. I did read and follow the instructions to season the pan first. I also paid attention to the part that said, when it eventually began to stick a little (see first sentence), simply re-season the pan. And if you use this on a glass-top stove and you slide the pan around, it will scratch. The warnings that come with the stovetop say that. Did you look at the bottom of the pan? Anyways, snark aside, read instructions and warnings carefully and apply a little common sense. So far, I am enjoying this product very much and it is living up to my expectations for non-stick, easy-clean, versatile and great heat-conducting properties. I purchased one square frying pan from Bed Bath & Beyond and ordered (via Bed Bath & Beyond) one large pan (kit). I brought home the square frying pan and read the instructions. I was still not sure that I could use it on my black glass top stove (electric), though the instructions read that it can be used on all stoves. I decided to call the customer service number and make sure I could use it. I was advised absolutely. I used it and 1), the food did stick, and 2), and far more important, my 8-month-old electric glass top stove was scratched. I was extremely upset and called customer service, and they said that there had to be something wrong with the pan. Both I and Bed Bath & Beyond checked it. There was nothing wrong with the pan. Bed Bath & Beyond refunded my money for both of the pans, however, Copper Chef took no responsibility. I feel that if you have a glass top stove, DO NOT use Copper Chef. Really like my square pan! I ordered this through a special offer that came in the mail to get in sweepstakes, but also because my mom had one and swore by it. She has the round one. I do use the pan quite often, and it does scramble eggs great, cooks evenly in the oven, makes pork chops great, etc. Nothing yet that has been bad, but I have had to add oil mid cooking to ensure once I saw the sticking beginning to happen (chops). There are some downfalls. For the most part, it is easy to clean, but I typically use a little soap to ensure all the grease remnants are gone. I've never had to scrub it ever, even the next day. I have found that with most cooking, I do need to use at least a little spray oil or regular oil for food to not stick. Not as much as other pans, but definitely a little. I did not want to try it in the dishwasher. The red bottom does scratch easy, but the copper inside is not scratched at all. I leave this out because it's great for so many quick things like eggs, grilled cheese, etc. My only wish is that it came with a glass top lid and that the square pan came in a bigger size as well. I love it. I seasoned it according to the directions and the cooking and clean up are exactly as advertised. I also own a Copper Chef, which I do not like. It scratched after two uses and did not clean like the Red Copper one. I plan to purchase more when I can afford it. My Square Dance Pan was a Christmas gift. The non-stick disappears after a few uses. It is not as bad as a regular pan but nowhere near like it was when new. It is non-stick and has better heat distribution. The whole pan heats, instead of just what is above the burner. It is sturdy and easy to use. My favorite pan. I've been using this plan for a couple weeks, so far it works as advertised. But buying the Red Copper Pans would be more enticing if they came with lids at no extra cost. Everything sticks to it except your money. LOL They got it! Write a Review for Red Copper Square Dance Pan!